Tag: Airborne – Up! UP! Stamps used are “Bird with Grass”, “Airborne – Up! 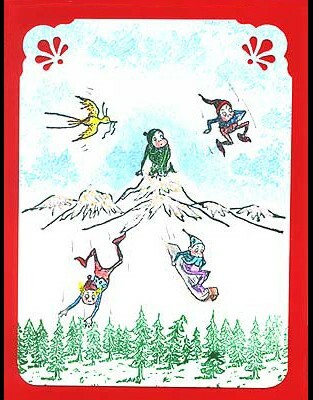 Up!”, “What?”, “Snow Capped Mountains”, “Tabogganing Downhill”, “Airborne – Where’s the Bottom?”, “Pine Forest” and have been colored with pencils, snow is puff embossing powder with glitter. Corner punch is tear drop and is layered on red glossy card stock. Card by Margaret Wiggin.